Why Cantor Lost – This Picture Says it All | Virginia Right! Eric Cantor Poll Worker at Lee Davis precinct. Worth 1,000 words. Photo by Debbie Wetlaufer. It was that kind of day for Eric Cantor. Debbie Wetlaufer was hard at work at the Lee Davis precinct in Hanover County during yesterday’s primary election. This young man was representing Eric Cantor and, well, he was a lot like the Maytag repairman. Not because Cantor wasn’t broken. But because he was beyond repair and in need of replacement. While Debbie worked tirelessly as the people came up to vote, nobody really wanted to hear about Eric Cantor. Most of Hanover voted 70% or better for Dave Brat. I expect Cantor and his supporters will have a lot of time to rest now. And by the way, this young man was a paid Cantor worker brought in from Northern Virginia – and does not live in Virginia. And Debbie Wetlaufer is a former Cantor volunteer who, like many of us, had grown tired of Eric Cantor. But if you had to tell the story of Eric Cantor’s defeat, this picture captures the essence of that defeat. Quite the metaphor. 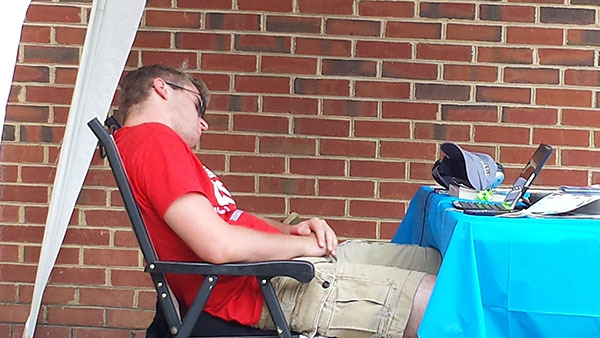 Paid Cantor worker shipped in from out of district, asleep a the polls. Priceless! Let’s win graciously people. Brat is going to need Cantor supporters, volunteers and voters to win in the fall. I volunteered for Dave Brat at a precinct in Henrico yesterday and the Cantor worker was also a hired hand. Gosh… he was a paid worker for Boehner primary as well in May. Said Boehner and Cantor are two of his \’unnamed\’ company\’s select clients. Paid Cantor poll worker at the Laurel Meadow polling site as well. Eric Cantor is a Lawyer and the only Republican Jewish Lawyer in the Congress. He is an establishment insider and is a conservative in name only. Both parties are in league against the American people. I have little faith in GOP or democrats since they both allow the total disregard of our rights under the constitutions both state and federal. We the people need to wake up and start studying the history to prevent a repeat of what happened in 1939 Germany. We are in a police state and until WE start to address it collectively, it is only going to get worse. Dave Bratt is making the right noises (for now), his actions will speak louder than his words. My Father told me that you can always tell when a Lawyer/politician is lying because their lips are moving. I for one will not be holding my breath….